Win or lose on Oct. 22, the energized opposition force coalescing around Tokyo Gov. Yuriko Koike is already changing the political conversation for the better in three specific ways. One, it’s upping pressure on Prime Minister Shinzo Abe to get serious about reforms to reanimate the economy, not just rely on a weak yen and spin. Two, it’s calling the Liberal Democratic Party on its counterproductive fealty to nuclear power. Three, it’s challenging the LDP’s misguided we-must-raise-taxes mantra. This last topic deserves far more attention than it’s gotten. Support for halting the consumption tax hike is a litmus test for joining the Tokyo governor’s Kibo no To (Party of Hope). One can hope the debate this generates ahead of the snap election highlights the lunacy of raising levies on a deflation-plagued population that hasn’t had a healthy raise in decades. The last time Japan raised the consumption tax — to 8 percent in 2014 — the hit to gross domestic product was immediate and unmistakable. Getting growth back on track required sizable increases in monetary easing and fiscal loosening. In other words, a tax increase aimed at paying down debt required more borrowing to soften the blow. How does that work? 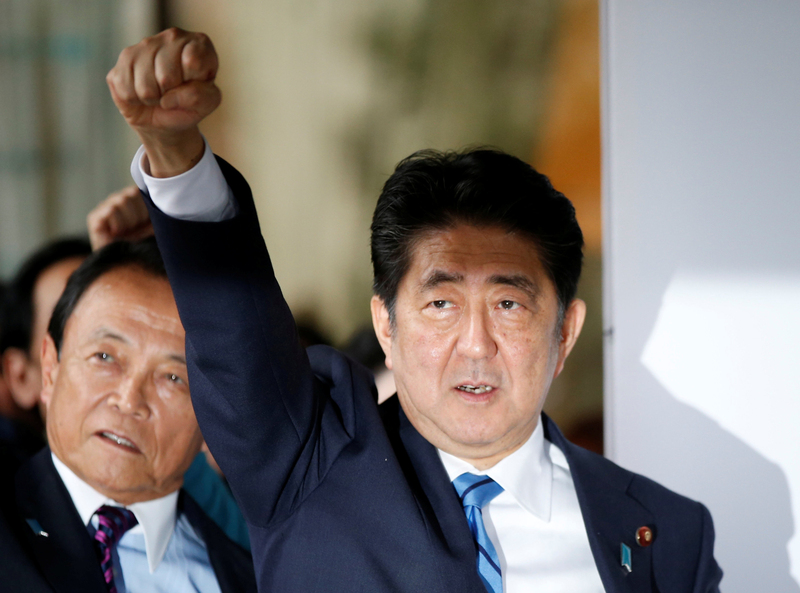 Boosting the consumption tax to 10 percent in 2019 is another example of the Abe administration treating the symptoms of a multi-decade funk, not the underlying causes. Since 2012, Abe has pledged to loosen labor markets, break up bureaucracies, increase innovation and productivity, empower women and deregulate industry. Mostly, though, Abenomics resorted to the same-old, same-old ploys of massive Bank of Japan easing and a weaker currency, while avoiding the real impediments to greater dynamism. If Abe spent less time trying to tweak the war-renouncing Constitution and more on engineering a startup boom, prodding executives to boost wages and creating new growth industries, Tokyo wouldn’t need to raise taxes. Tax receipts would swell along with increased consumer and business spending. 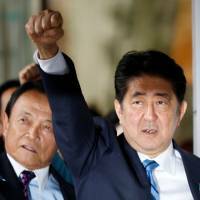 Abe, meanwhile, is already earmarking the 2019 tax hike to providing free education, not government debt reduction. A laudable goal perhaps, but one that won’t revolutionize a rote system that teaches facts and dates, not creativity or critical thinking. Again, treating the symptoms, not the problem. Abe also wants to cut the corporate tax rate. The real impediment is an insular, opaque and rigid corporate culture that turns off foreign investors. That, and the fact that more than 70 percent of companies pay no, or very little, tax anyway. Koike’s new party doesn’t have all the answers, either. Its growing list of conservative litmus tests — including support for constitutional revision and the 2015 security legislation — seems ill-advised. Japan already has one conservative party. Does it really need another that disqualifies left-leaning lawmakers? Still, Kibo no To’s break with Japanese tax orthodoxy is both refreshing and wise. I’m not a fan of magical supply-side thinking. For a look at fanciful economics, check out U.S. President Donald Trump arguing he can slash taxes for all Americans and companies, while simultaneously cutting the national debt. But then Abe’s party also ascribes magical powers to Japan’s debt burden. Its position is don’t worry about the combination of the largest public debt burden, a rapidly aging population, a negligible birthrate and deflation. It’ll all get sorted someday. Abenomics, remember, is really Koizuminomics with a bigger dose of central bank largess. Abe’s mentor, former Prime Minister Junichiro Koizumi, put the issue of structural reform on the discussion table between 2001 and 2006. Hopefully, Koike, another Koizumi protege, entering the electoral fray will catalyze Abe to return to basics and remove the weights from Japan’s ankles. That means incentivizing entrepreneurs, pressuring Japan’s biggest companies to fatten paychecks and increase investment, and crafting a pro-growth energy policy focused on renewables. Tokyo must address more than just the manifestations of its troubles. Part of this rehabilitation is learning how to live without steroids like zero interest rates and ever-larger borrowing. All raising the consumption tax does is enable the let’s-borrow-more mindset that’s left Japan with a lower credit rating than China — and add to Tokyo’s growth headwinds. Koike’s new party gets that. It’s time the rest of the political establishment did, too.